GOLD AND BLACK ILLUSTRATED VOLUME 28, ISSUE 5 19 what you thought they could. Obviously, the sooner we can do that, the better." Q: Did you find your personality on defense or was that hard to do with all those young pieces there? Brohm: "I think we still have a little ways to go on the defensive side of the ball. I think when it's all said and done, we're going to be a good defensive team. Will we have the experienced and bona-fide guys who have been there and done that before? No. I think the first group of guys will not have the experience, but if we continue to develop them, hopefully they can play close to that same level, as far as getting backups on the field, I think there's capable bodies. It's just that they have to continue to develop. They're young. Lorenzo Neal didn't play much this spring. I thought Anthony Watts emerged and can help us on the inside. Kai Higgins, even though he was injured a bit, when he's healthy, he can be a productive player for us. Giovanni (Reviere) on the other side is a big, strong defensive end who can do a decent job. The inside 'backers, I feel good about. T.J. Jallow on the outside or our nickel position, we still have to get better, but we improved there. I think our secondary, Jacob Thieneman was out, (Navon) Mosley and (Simeon) Smiley, we have experience there. At the corner position, we have depth. I think we have some guys who can play." Q: Would you antici- pate playing more zone or man this season? Did that change with the per- sonnel you have now? Brohm: "It's hard to say at this point. I would say it'd be very similar to last year just going into it and we'll see how it plays out. You'd like to play a little bit more man and mix it in, but you have to be able to do it. It's too early to tell on that. But we would like to get to that point." Q: You'd said to BTN right after the spring, as it related to the receiver position, "I don't think we have anyone who is above average. … I don't see anyone being special." That's not where you want to be coming out of spring, right? 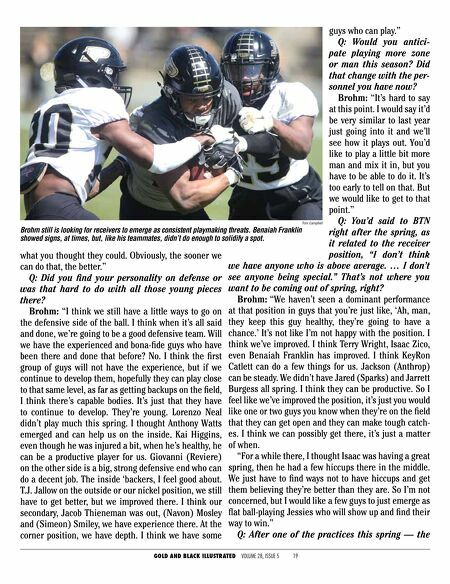 Brohm: "We haven't seen a dominant performance at that position in guys that you're just like, 'Ah, man, they keep this guy healthy, they're going to have a chance.' It's not like I'm not happy with the position. I think we've improved. I think Terry Wright, Isaac Zico, even Benaiah Franklin has improved. I think KeyRon Catlett can do a few things for us. Jackson (Anthrop) can be steady. We didn't have Jared (Sparks) and Jarrett Burgess all spring. I think they can be productive. So I feel like we've improved the position, it's just you would like one or two guys you know when they're on the field that they can get open and they can make tough catch- es. I think we can possibly get there, it's just a matter of when. "For a while there, I thought Isaac was having a great spring, then he had a few hiccups there in the middle. We just have to find ways not to have hiccups and get them believing they're better than they are. So I'm not concerned, but I would like a few guys to just emerge as flat ball-playing Jessies who will show up and find their way to win." 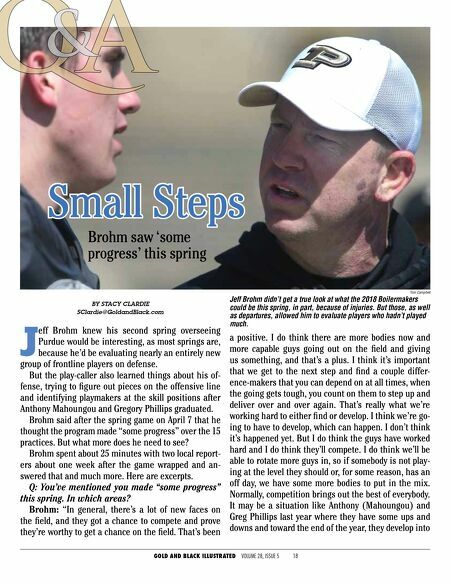 Q: After one of the practices this spring — the Tom Campbell Brohm still is looking for receivers to emerge as consistent playmaking threats. Benaiah Franklin showed signs, at times, but, like his teammates, didn't do enough to solidify a spot.